Artistar Jewels restarts and unveils the details of its fourth edition. It’s a very important appointment that from the 23rd to the 26th of February is showing the protagonists of the contemporary jewelry scene in the special location of Palazzo Giureconsulti at the hearth of Milan. Artistar Jewels represents a benchmark in the contemporary jewelry scenario. The Project selects more than 200 creations, chosen according to their artistic value, the technical experimentation and the stylistic research. In so doing it serves as an international window for famous artists and as a springboard for the emerging ones. It’s the unique contest in Italy, and one of the few in the world, providing for an original and transversal interpretation of the contemporary jewel development. 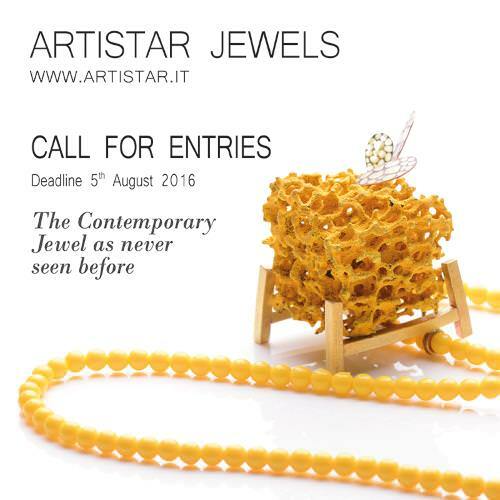 Artistar Jewels gives the participants the special opportunity to directly sell their creations to the public through the online shop www.artistarjewels.com, additionally, the project gives the possibility to publish some of the artists works on an international volume. This initiative started in 2012, anticipating the future market trends and proving to be the first company in Italy to employ the web potentialities in order to improve the contemporary jewelry dissemination. This year again, the selected designers will have their creations presented in the book Artistar Jewel 2017, published by Logo Fausto Lupetti Editore. The volume will be available both on the national and international market: it will be sold in Italy and in the European main capitals and will also be delivered to more than 5000 professionals in the sector. The introductory texts of the book will be written by Eugenia Gadaleta, that, as well as being the Artistar Marketing & Communication Manager, will take care of the Artistar Jewels special contents with Selene Oliva – freelance fashion journalist for Vogue.it and Cameralook.it Digital Specialist Fashion & Luxury. Artistar Jewels’s fourth edition is characterized by several appealing news. Starting from the exclusive Giureconsulti Palace, accurately chosen to be the location of the exhibition that, for the first time, will take place during the February edition of the Fashion Week. It’s a very strategic moment, in fact, in this period great excitement is concentrated around Milan. During this week, the city is the focus of the international media attention, and it’s also visited by international buyers coming from worldwide. The jury too is composed of new special members: Gianni De Liguoro co-owner and founder of the famous bijou brand De Liguoro. Bianca Cappello – jewel critic and historian – Guido Solari – Scuola orafa Ambrosiana founder and owner, based in Milan, Savona street, 20. Three winners will have the chance to participate for free to Artistar Jewels 2018 and will also have a dedicated area in the 2018 book special contents. Additionally, for the first time, their creations will be among the thirty ones chosen by Artistar.it team to be the protagonists of a moving international exhibit. This multi-shows event will be organized in different prestigious art galleries. Another important innovative element is represented by the opportunity for one of the participants to collaborate with the bijou brand De Liguoro. The artist will be personally chosen by Giovanni De Liguoro and will have the chance to personalize a piece of the collection produced by the important Italian maison. This is an important initiative aimed at creating new synergies, it’s a perfect combination between tradition and innovation. Scuola Orafa Ambrosiana di Milano also offers, as special prize to one selected designer (under 27), the free participation to the course of Professional Goldsmithing. Here students will learn the main laboratory techniques by realizing various jewelry objects. Within the exhibition there will be a special area dedicated to the creations of the famous bijou maison De Liguoro. Winners announcement ceremony will be on February 2017 during the February edition of the Milan fashion week in Palazzo Giureconsulti.